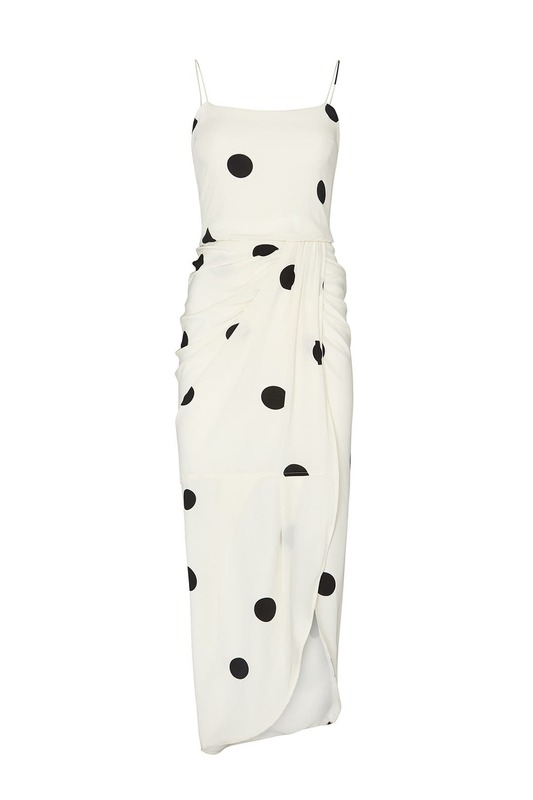 Draped and dotted just right, this Derek Lam 10 Crosby dress is both playful and polished. Sized: 0-20, one length available. Regular measures 48" from shoulder to hemline. 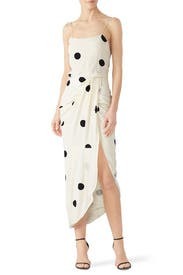 Cream polka dot printed crepe de chine (55% Silk, 45% Viscose). Hourglass. Sleeveless. Square neckline. Hidden back zipper with hook-and-eye closure. Fully lined. 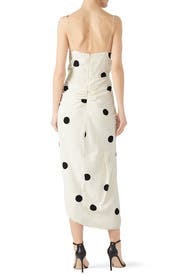 48" from shoulder to hemline. Imported. Super cute and stylish!!! Dress up or down! Can be dressed up or down. A bit sheer so might not be able to wear underthings but absolutely love this dress! I was worried that the slit would be to revealing but it kept closed nicely only showing enough thigh. Very soft material but zero stretch. I was so sad about this dress. I wanted to love it. The print is darling. However the fit was weird and very unflattering. Even though it is lined it is still very see through even with white undergarments. I ended up passing and sending back. I wanted to keep it! I absolutely loved this dress. I wore it for a spring wedding and got so many compliments. It was different and didn't upstage the bride. It was very comfortable too. My only complaint was that it was a tiny bit big. I probably could've worn the 0 but the 2 didn't look huge. It wrinkles kinda easily so if you're going to be sitting a lot and are worried about wrinkles on the back, maybe not the best option. Looking great and being comfortable at the same time. This dress fit very nicely. True to size, not too long. Comfortable. Got tons of compliments. Trendy. Only con was spaghetti straps kept falling off shoulders but still worth it.